It was a script that would have made Rocky Balboa proud. In just its second year of competition, the McGill Chem-E Car team defied all odds to tie for first place at the recent national championships in Salt Lake City, Utah. The McGill squad beat out 35-team field – including competitors from South Korea, Saudi Arabia, Mexico and Qatar – to finish tied for top spot with perennial powerhouse and three-time champion, Cornell. In ti to win it: Members of the upstart McGill team just moments after winning the 17th annual AIChE Chem-E Car competition in Salt Lake City, Utah. / Photo courtesy of the American Institute of Chemical Engineers. “It was unreal. I’m still smiling,” said Ali Sahmoud, captain of the McGill Chem-E Car Nationals Team. The Chem-E Car competition is an undergraduate design competition hosted by the American Institute of Chemical Engineers (AIChE) in which teams of engineers from universities from across North America and around the world design and build small cars – ranging in size from shoeboxes to fire hydrants – powered and stopped exclusively by chemical reactions. The primary objective of the competition is performance – each car must carry a weight between 0 and 500 grams over a precise distance between 15 and 30 meters. The designs and fuel choices showcase the teams’ creativity and innovation. 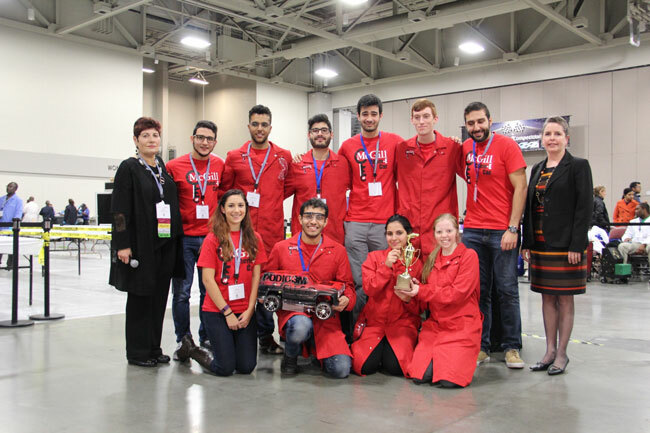 “The Chem-E Car competition is a great avenue for students to apply chemical engineering principles in a creative way and in a group setting, they are critically important skills for these young professionals to have as they begin their journeys in the industry,” said Cheryl Teich, AIChE President. An hour before the competition, the students are told the load of water their car must carry and the distance it must travel. The students then must calculate the appropriate chemical reaction that will propel the car as close as possible to the distance goal. This year, the cars had to carry 230 millilitres of water for 20.3 meters. What made the McGill team’s victory even more remarkable was how the team bounced back from a disappointing first round. Undaunted, the McGill team did what engineers do best – they adapted and overcame. Cue Eye of the Tiger. And that run was as epic – or as epic as can be involving a car that can fit in a breadbox and travels at strolling speed. In a video of the gold-medal run, another member of the McGill team can be heard saying “Come on, don’t fail us,” off camera as Navona creeps down the floor. The improbable road to victory in Salt Lake City went through Boston where, earlier this spring, the team finished second at the AIChE Northeastern Student Regional Competition to qualify for the national championship. But rather than hit cruise control until the finals, the McGill team worked on Navona relentlessly over the summer and fall. For starters, they adjusted on the power source, decreasing the size of the lead flow battery to make the car lighter. Additional work was done on the car’s electronic system and the wheels were changed to give it a better, and more consistent, grip on all types of surfaces. The team also tweaked the chemicals in the stopping mechanism to improve reaction time and accuracy – one of the keys to the big win in Utah. Prior to the nationals, Navona had a lag time of several seconds between the chemical reaction of the braking mechanism and the actual stopping of the car – which could translate into stopping up to two metres away from the finish line. “By the time we got to Salt Lake City, we were less than one second,” said Sahmoud. True to form, the McGill squad is not resting on its laurels. A second team has already been developing a completely new model Chem-E car for next year’s regionals. While the new car will be similar to Navona, it will employ a new stopping mechanism using a baking soda-produced reaction as opposed to the current iodine-based one. Learn more about the McGill Chem-E Car on the team webpage or on its Facebook page. Excellent, when is the victory parade?